Ricoh publishes White Paper to express our vision behind the development of our products, services and corporate activities. In the rapid changes of the work environment, manufacturing method that enables quick response to latest customer needs is required. Since 2002, the Ricoh group has been conducting customer-focused development process innovation. The home position of our innovation efforts is with the customers, and our goal is to increase customer values. The innovation has five pillars: platform and module design, robust engineering, 3D design, design resource optimization, and cultivating innovators. This white paper clarifies why the innovation is needed, how it has been conducted, and what values it has yielded. How are fast-moving ICTs (Information and Communication Technologies) applied in a company or an organization? Are they perceived as easy to use and secure? This white paper introduces case studies where the introduction of a new Ricoh collaboration tool, easy to use and secure, not only saved cost and time, but also significantly changed the qualities of business and service. Customers who adopted Ricoh's ICT tool discovered new value in reforming communications for their organizations, and further, some felt improvement in their individual quality of life. Diverse businesses have improved competitive power by introducing diverse work styles. The workforce is now dispersed, restricted by neither time nor place. Because of this dispersion, various systems have appeared to support collaboration. One such system is the video conference system. This document clarifies new value brought about by the unified communication that Ricoh proposes. Ricoh has been providing automation and other labor-saving systems in many areas using machine vision. Our machine vision activities are now in their second stage and we are working on how we can elevate workplaces into a space for knowledge creation. Our system autonomously generates rules, understands the situation, presents optimal methods, and helps people at work to make decisions quickly. Ricoh aims to establish a smarter workplace through collaboration between intelligent machine vision and knowledge workers. 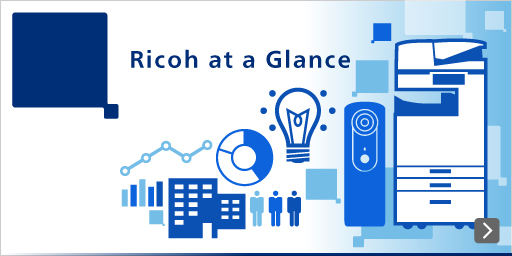 As the range of machine vision applications continues to expand, Ricoh is providing new value propositions that integrate the optics, electronic devices, and image processing technologies cultivated through its history. Ricoh's machine vision solutions are already being used in such fields as factory automation (FA), on-board systems, security, and the distribution of goods. In the future, Ricoh will continue to contribute to the social infrastructure with optical system technologies that satisfy a broad range of needs from 2D and 3D imaging to invisible and multidimensional domains.